In this era of unprecedented data generation, cancer registrars must face the onslaught while meeting more stringent requirements. Over the past five years, it's been clear the demand for cancer registrars has increased as the amount of available cancer data mounts. Health care organizations track cancer patients from the day they are diagnosed until the end of their lives, compiling data about their treatment no matter where it's delivered. Numerous factors have conspired to elevate the cancer registry profession to the point where its future is brighter than ever. The rapid deployment of EHRs, the explosion of data generated by emerging fields such as genetics, tougher accreditation requirements, and the demands of new payment methodologies have all played a role. Previously, cancer patients were seen as a set of symptoms or disease manifestations independent of their environment (eg, toxins) and social factors (eg, second-hand smoke). Now there's an effort to consider context. For example, why do the poor have lower survival rates for colorectal cancers than wealthier people? Digging into such data can produce clues that will assist patients to either avoid cancer or have the tools to fight it. 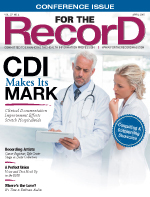 The relationship between cancer registry and EHRs is still evolving. On the whole, the quality of the EHR and its execution can make the performance of the cancer registry better or worse. Positive outcomes include gaining accessibility to valuable information through the EHR to enable staff to work remotely. In addition, other systems necessary for cancer abstract completion such as pathology reports are often accessible in electronic systems. However, the quality of the scanning functionality integrated with the EHR can be just as important as the EHR itself in terms of the ability to find information among scores of scanned pages. Whether EHRs can keep up with the growing demands of registrars to gather more complex information may be problematic. If organizations have not implemented standardized templates for physician documentation, the information required by registrars may be documented in numerous places in the EHR or not at all. For example, cancer staging must be documented by a physician but can be located in various parts of the EHR or in other systems (eg, pathology). Health care organizations participating in quality programs such as the American Society of Clinical Oncology's (ASCO) Quality Oncology Practice Initiative (QOPI) must meet reporting deadlines. The data elements required by the ASCO must be documented in the EHR within preestablished timeframes. • The patient may have first visited a non-Presbyterian physician's office, making it more difficult to acquire information from the initial encounter. • That office also may have performed the first biopsy. • Required radiology information may have to be gathered from another organization or a Presbyterian-aligned radiology group that uses another electronic system (non-EHR). • Patients who present at Presbyterian for surgery receive follow-up care with a medical oncologist at an MD Anderson satellite (a Presbyterian alliance), requiring further information gathering from a physician who may not be part of the Presbyterian family. • The organization must be able to exchange cancer data with other entities, including competitors. • The patient must be followed for five years. It's evident the workloads of registrars will multiply in an effort to find the documentation necessary to create a survivorship list. However, the more closely aligned the EHR is with the organization's other systems, the easier this task will become. For example, MD Anderson's custom-built EHR system, ClinicStation, does not contain all the data from other systems (ie, pathology and radiology), but it does interact with those systems, making it easier for the organization to meet quality initiatives. It's interesting to note that MD Anderson is in the process of moving to Epic's EHR and attempting to retain its current ability to easily access information from other clinical systems. Presbyterian's advanced cancer registrars have developed templates from which much of the survivorship list data can be automatically extracted. Nursing can add text information as needed, and clinicians no longer have to waste time on redundant documentation. However, getting these templates to become an integral part of the Epic application is a significant challenge, Hahn says. Although many organizations participating in the QOPI would like these templates to be part of their EHR, long delays—up to two years—have been encountered in getting vendors and some organizational leaders to accommodate the need to collect additional cancer patient data from all participating parties in a streamlined and timely manner. Throughout much of the industry there's concern about obtaining high-quality, all-encompassing data. When creating a longitudinal, lifetime view of patients, the data must be correct. Because cancer registrars are downstream from those entering the data, the patient information they receive may be inaccurate or incomplete. For example, if an organization employs a stream of contract coders whose biggest mission is to code as many records as possible in the shortest time possible to achieve maximum reimbursement for both the coding company and the provider, data not directly affecting billing may be left behind. In this instance, cancer registrars are forced to search records for comorbidities or other bits of critical data that will influence future treatment as well as any research dependent on comprehensive information. MD Anderson is fortunate to be a tertiary hospital reimbursed at levels above those of facilities providing routine care. The Houston-based hospital, which receives 47,000 patients annually, many of whom are already seriously ill, does not outsource services, including coding and cancer registry, involving the collection of critical data. With a staff of 24 registrars who perform abstracting, follow-up, and consultations, MD Anderson functions as a hospital registry rather than a cancer registry. Associate Director of Cancer Registry Kelly Merriman, MPH, PhD, CTR, says that because all 47,000 patients are in the registry, every biopsy—even those returned as normal—and every record post-March 1, 1944, are included. With the country's only oncological emergency department providing lengthy and detailed documentation, MD Anderson has historically engaged in efforts to look at longitudinal patient records, including documenting postsurgery treatment plans and searching for time of death. However, because 34% of MD Anderson's patients reside outside Texas, it can be a challenge to track down postsurgery data. Beginning next year, The Commission on Cancer's Rapid Quality Reporting System (RQRS), currently focused on breast and colorectal cancers, will impact reimbursement. Previously exempt from reporting metrics to gain reimbursement, MD Anderson will have to demonstrate it meets performance standards, including the tracking rates of all patients, many of whom visit other facilities for follow-up treatment. Currently, portions of the medical record are scanned into the EHR system, requiring registrars to page through the electronic chart to determine the location of the patient's follow-up, the physician, and the beginning and ending dates of chemotherapy or radiation therapy. They also must locate any staging information in other health care systems. For example, MD Anderson features the nation's largest sarcoma program, which makes it difficult and time-consuming for registrars to gather the RQRS quality indicators. It can be expensive to gather high-integrity, comprehensive data, but wise organizations reuse this valuable resource. For example, MD Anderson retains all of its scheduling data, a decision that proved invaluable when it came time to renovate its campus. The organization used warehoused data to project which programs had large enough patient volumes to merit entire new buildings for procedures and treatments. Of course, the benefits of comprehensive data collection are topped by its ability to save lives. For example, researchers now are empowered with powerful knowledge bases to determine the impact of socioeconomic factors on cancer development. ICD-10 will add even more details to existing depositories. The 2014 study "Inequalities in Premature Death from Colorectal Cancer by State," conducted by Ahmedin Jemel, DVM, PhD, with the American Cancer Society in Atlanta, used socioeconomic data to expose the failure to properly identify and treat many patients with colorectal cancers. In a Journal of Clinical Oncology editorial, Blaise N. Polite, MD, MPP, of the University of Chicago Medical Center wrote, "The major finding from this study remains unaltered: If you are black or have low educational attainment, where you live in the United States determines how likely you are to die as a result of colorectal cancer." Through its newly launched Action Network, The American Cancer Society is using this research to make legislators and other stakeholders more aware of this disparity. This type of "data action" can allow health care professionals to adopt measures in advance of cancer formation. By changing educational and social factors rather than trying to catch advanced cancers when it's too late, lives can be saved. Besides maintaining accreditation information and validating reimbursement, cancer registry data also can be reused for physician in-services, and to review staging behavior, assess insurance types, create physician reports, and, most importantly, determine appropriate staffing considerations. Cancer programs must determine the type of physicians needed and what attributes to focus on during the hiring process. For example, is the candidate good with patients and a skilled documenter? How familiar is the physician with EHR systems that demand the creation of a complete picture of the patient? There is almost limitless potential for the use of detailed cancer data beyond hospital walls. Merriman, who expects data to be shared more extensively between organizations, says there's a movement afoot in the cancer community to tie systems together. She cites the important work of Theodore J. Williamson, MD, PhD, CTR, a radiation oncologist, who, with his wife Eileen, created ONCO, an organization "based on the idea that cancer registry data is a unique and powerful tool in the fight against cancer." Besides MD Anderson, other health care organizations, including Sloan Kettering, Johns Hopkins, and some Canadian systems, are jumping onboard with the idea of sharing cancer information. It is hoped that the advent of health information exchanges will result in a standardized language to help registrars code correctly. Hahn says clinicians must be "taught the same language" in order for cancer data collection to be uniform across the country. For example, registrars cannot collect documentation that says "suggestive" of cancer but can document cases "suspicious" of cancer. Registrars must be ready to collect more and better data, while health care managers must be prepared for more data requests and greater demands from accreditation organizations. This may result in the need for additional registrars and greater automation. Indeed, "data acceleration," which refers to the need to speed up the interoperability of systems to allow data to arrive at decision makers more quickly, has emerged as an industry buzz term. The information generated by these findings can help industry leaders spot potential fraud—for example, asbestos exposure related to mesothelioma—prevent brain cancer caused by the use of hormonal contraceptives, and investigate how marijuana can be applied to cancer treatment. In addition, genetic data can lend insight into the implicating predispositions of cancer development, particularly in the context of social and environmental factors. In an ideal setting, all this research would be culled from standardized, fully documented data in interoperable EHR systems. To make this a reality, cancer registrars must continue to develop and expand their expertise. "Registrars have sharpened their skills and are collecting more data. They have become more astute abstractors," Hahn says. "Even when their EHRs are less than perfect, they know the data will be useful, so they just keep looking until every morsel is found."